We at Frecklebox love reading (can you tell?) and think reading out loud to your children is the best present you can give them. Short picture books are fantastic, but even little kids can get stay engaged in longer books a chapter at a time. It’s a great opportunity to reread all your favorite books from when you were growing up, but nothing is more disappointing than realizing a book you loved as a child hasn’t stood the test of time. We have road-tested these favorites as both kids and adults, and we can vouch for their greatness at any age. Rediscover these classic children’s books that you will appreciate along with your kids. 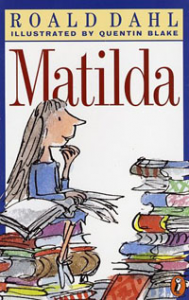 Matilda by Roald Dahl Roald Dahl is one of the great masters of children’s literature and though we adore Charlie and the Chocolate Factory and The BFG, Matilda just might be his best book. Matilda Wormwood is a child prodigy with special powers, but her negligent parents and tyrannical headmistress see her as nothing more than a nuisance. Matilda uses creative and hilarious pranks to get even, and you’ll find yourself cheering her on with every new trick. Hatchet by Gary Paulsen Hatchet is every adventure-minded child’s dream come true. Brian Robeson finds himself stranded in the Canadian wilderness after the small plane he is in crashes, and he must learn to survive with only a hatchet to help him. Half Magic by Edward Eager Siblings Jane, Mark, Katharine and Martha are facing a dull, slow summer when they discover a normal-looking coin can actually grant their wishes… but only halfof each wish. The coin takes them on fantastic adventures, from King Arthur’s Court to the Sahara Desert, and the story will keep you on the edge of your seat. Treasure Island by Robert Louis Stevenson Pirates, adventure, buried treasure—this book has it all. Jim Hawkins, the young narrator of the story, is the son of the owners of the Admiral Benbow Inn who is unwittingly drawn into a hunt for buried treasure and an intrigue involving a fearsome one-legged pirate. The novel has some violence and suspenseful moments, so it’s best for older children. What were your favorite books growing up? Have you reread them to your children? For more books your kids will love, even when they’re all grown up, check out the selection of Frecklebox personalized books.